After the long winter the hills are appearing again from beneath the snow drifts. The air temperature hovers a bit above freezing at night, and rises to double figures during the day. The oyster catchers have arrived upriver from their winter quarters on the coast. Pigeons are making love amidst a lot of cooing, and the last of the salmon kelts, mainly female fish because the male ones are nearly all dead, are slowly making their way to the sea. If the number of fish that spawned = 100% we can expect only 2/3% of females to survive to spawn again, and virtually no males. Survival at sea is very poor, much worse than 50 years ago when ‘second returners’ were not unusual. Today they are a rarity. We are now awaiting the arrival of the first spring salmon. Some may already be in Finavon’s pools. or have passed through to the dubs and rocky gorges upstream at Inshewan or Cortachy. Some may even be well up into Glen Clova. But my guess is that the rising water temperature and water levels will persuade fish to enter the river in good numbers within the next two weeks. I expect us to catch our first salmon of 2010, as opposed to the dozen or so kelts already caught and returned by our local anglers, within the next 2/3 weeeks. It could be tomorrow! Whenever that does happen, it marks for the FCW team the real start of the new season. 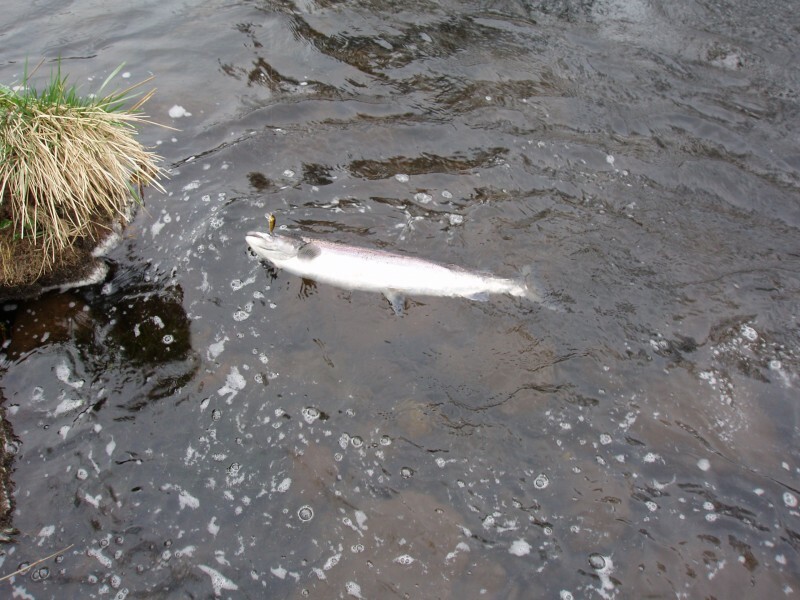 The salmon in the photo is a nice example of an early April South Esk salmon caught in 2009, just a bit smaller than the average weight for spring fish, which is 9lbs. Our other news is the successful completion of constructing the new track for 4×4’s, and enterprising drivers of normal cars, and a big wildlife pond in David’s Wood, where we will be building what we think may be Scotland’s first tree-house fishing hut in a group of four beech trees overlooking Pheasantry and across to the ancient vitrified fort on top of Finavon Hill. More about these developments in later blogs.